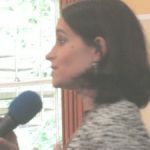 Justine leads on vision, strategy and communications. Her raison d’etre is bringing people together, putting spiritual values into action and co-creating innovative projects that speak to the urgent needs of needs of the time. Her goals include advancing the next generation of leaders and peace-makers, and building resilience for an increasingly dystopian world. 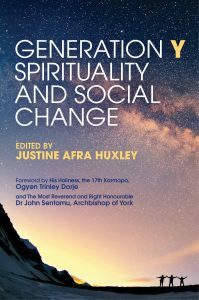 This collection of interviews and stories focuses on how the younger generation are engaging with faith, spirituality and social action amid the challenges of our times. Adam Bucko, Xiuhtezcatl Martinez, Emmanuel Vaughan-Lee, Kara Moses, Abbas Zahedi, Camille Barton, Bruna Kadletz, Dekila Chungyalpa, Matt Youde, Amrita Bhohi, Sun Kaur, and many others. His Holiness the 17th Karmapa Ogyen Trinley Dorje, Llewellyn Vaughan-Lee, Dr John Sentamu, Archbishop of York, Tiokasin Ghosthorse, Rabbi Laura Janner Klausner, Bhai Sahib Dr Mohinder Singh, and more. Is the future ‘spiritual but not religious’? What’s the upside and downside of having no one particular tradition? Which religious institutions are still working for millennials and why? What gets the Gen Y vote? Does our faith inform our response to global ecocide? Are young people pioneering a new relationship with the natural world? How are young people ‘unbundling’ the elements historically found in faith institutions, and recombining them in organic, bespoke, self-organised communities? Gen Y and Z are dissolving binaries! We are no longer just male or female, but a much richer continuum. What about the binary of spirit and matter? How are the next generation reconciling the sacred and the everyday? We live in a global market place where every spiritual tradition is accessible. Does a pick and mix approach actually work? These days many are growing up in mixed race and mixed faith families – our identities are becoming complex and multi-faceted. What does that mean for the future? Social media means we globally connected – so do we feel and act like Citizens of the World? How do the younger generation really feel about the spiritual and political leadership of their elders? Are elders really listening? What about the G-word? Still relevant? Is our experience of ‘Something Bigger than Us’ still alive? Or is it being slowly strangled by the onslaught of consumerism? “The stories of the millennial generation collected in this book present us with new dreams, visions and ventures that can help to heal the wounds of our world. These multiple voices from different cultures and faiths belong to actively engaged trailblazers who are exploring spiritualities that are daring and challenging. Here we can meet people full of great hope and deep love for the whole Earth community of life. May their examples inspire many others.” Professor Ursula King, Professor Emerita Bristol University. “Justine Huxley brings open-hearted, generous curiosity to these remarkable conversations with people who reflect the leading edge of all that wants to emerge. Anyone who fears that our collective spiritual future is at risk will take heart from these deeply soulful, creative leaders!” Revd Dr. Sue Phillips , On Being Project and Harvard Divinity School. “This book is about how a young generation of humans are awakening to the mystery of it all, re-threading old paths, alchemizing new values, and constructing hope in a time of hopelessness. How they are rethinking identity, working with the sensuous in recalibrating responsiveness in a time of crisis, struggling with orthodoxy, and co-inventing new spaces of leadership.” Bayo Akomolafe, author.